In the context of the Art of Dining 2018, organized by AD Middle East and Mariana Wehbe PR, Karim Nader and his friends design a multi-sensorial dining experience celebrating the essence of oriental space in the dark shades of modern urbanity. Shoe-less and smoke-free, the guests are invited to reconnect with the ground sitting on the sensuality of Tabriz, Kashan or Nayin silk. 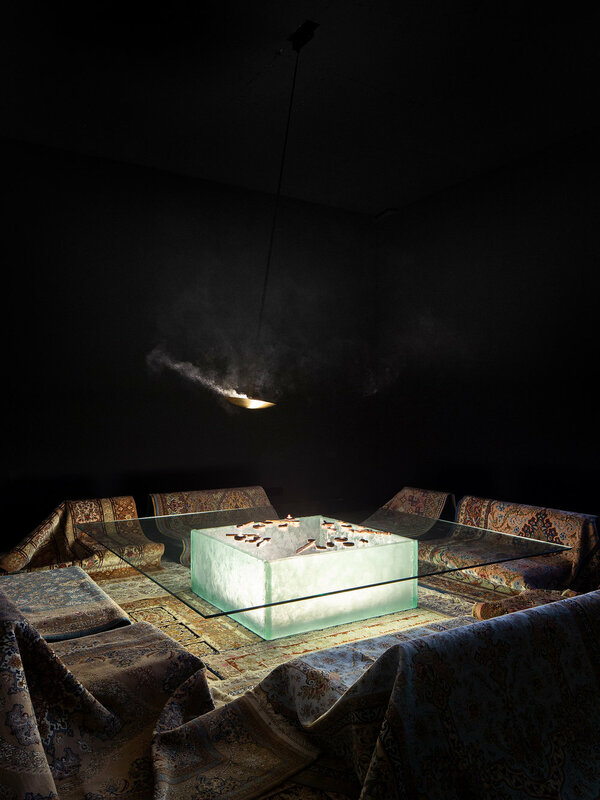 The complexity of Persian ornamentation is contradicted by sharp and minimal gestures: a simple square glass table that sits twelve with a glowing 'cube of ice’ base acting as the primal source of light in this otherwise dark and mystical space. Above, a brass line and razor thin saucer burns delicate aromas of selected incense of the Maronite monasteries while carefully hidden speakers at the four poles of the square room sound a very light and unexpected oriental jazz. Twelve hand-carved walnut spoons made for the occasion simply mark the places with colorful spices returning once again to the charm of the organic. Semi monastic, semi palatial; the nocturne majlis sits at the midpoint of our contemporary contradictions. Karim Nader Studio Team: Elias el Hage, Elie Christian Naameh and Christy Layous.